This is a funny time of year. My 4 year old is going through his last week of Nursery and we have 6 weeks of fun before he starts Reception. It’s both exciting and sad as we start a new chapter as a family. With him starting Reception we have a list of essential items to buy. I have really happy memories of the start of a new term. Do you remember shopping for a new school bag and lunch box? My favourite part was always shopping for new stationery, nothing beats the smell of a brand new pencil case, pencils and those strange mathematical things like a set square, which I’m sure I never actually used! I love buying stationery which is why I was excited to hear that Ryman have launched a brand new website. You can take a look here www.ryman.co.uk. Our local high street is pretty poor for shops so I do a lot of shopping online. Ryman have all the essential stationery that you could need for study, the office or your home. They also sell office furniture and technology, with everything from digital cameras and tablets, to printers and shredders. We’ve also been trying out some back to school crafts, our favourite was making a pencil holder. We just raided our recycling box for a tin can, made sure it was clean and dry and decorated it with some road track washi tape. Couldn’t be easier! Let me know if you have any back to school traditions as I’d love to hear them. My twins have their last day tomorrow and I’m so emotional about it. I can’t believe they will be at primary school come September! It’s a lovely idea about to do back to school traditions! I may steal a few! So simple, yet so effective. My boys have passata tins in their room as pencil tins! When I was a child we always went to Wimbledon Common on the Sunday before school restarted. We would pick blackberries and have a picnic tea. Inbetween we would go searching for Wombles. We try to do this now but this week the blackberries are already starting to ripen! We always do the photo at the front door too, just to see how much they’ve grown each year. I should actually take a photo on the last day too with how grubby and small the school uniform now looks!! love repursposing tins! I used to love stationary shopping ready for the new school year! This looks really smart and stylish. What a great DIY pencil holder! I always take my son to have his photo taken with his new school uniform and the hair cut. Getting the uniform and the hair cut are also part of start of the new school year. As well as choosing his school supplies and getting them all ready. My eldest starts nursery in September so we will hopefully start some back to school traditions – love these ideas! I didn’t with my son but I don’t think he’ll turn down pancakes on his first day in 6th form. Let’s enjoy the holidays for a while… this said, the holder will make for a perfect holiday craft project. Great post. Cheap and easy idea which will look great in kids playrooms. Thanks for sharing. There seems to be quite a lot of us waiting for our little ones to start Reception – I hope that we can have a fun packed few weeks before the school run re starts! 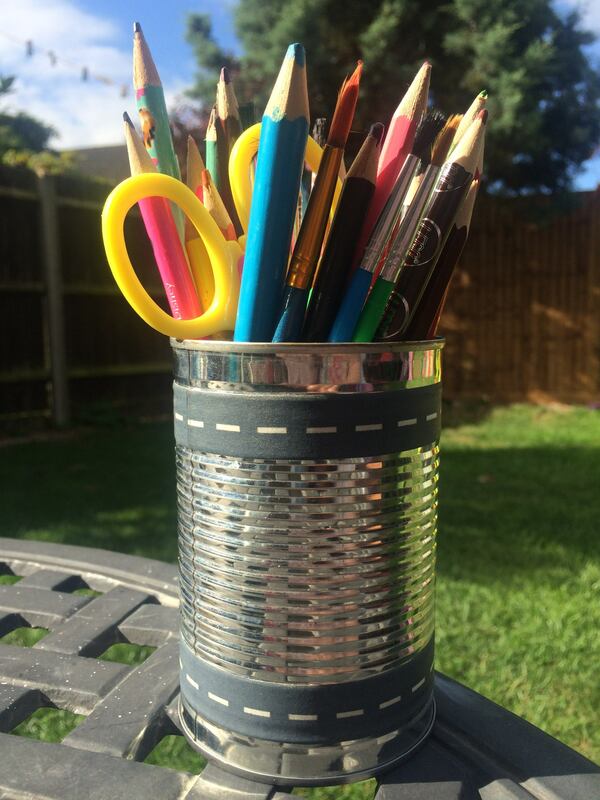 I like the tin can pencil holder!